I’m a featured plant-based athlete in the brand new book Vegan Vitality by Karina Inkster! 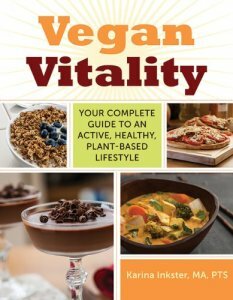 Check it out at http://www.amazon.com/Vegan-Vitality-Complete-Plant-Based-Lifestyle/dp/1629143642. Vegan Vitality (by Karina Inkster, foreword by Robert Cheeke) is a new cookbook and active living guide for vegans. My interview is on page 105 as a featured plant-based athlete! 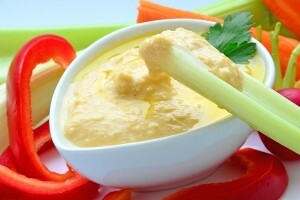 Veggies with hummus. This never gets old! I’m particularly fond of sliced cucumbers, carrots, and celery. Kale chips! You can get store bought ones, or make your own. I love making my own. Smoothies! Strawberries, 1/2 banana, and your favorite meal supplement or protein powder. I love chocolate vegan Shakeology myself, and it tastes good shaken in a shaker cup with just water and ice. No joke! Salads in general. Just watch the dressing! Need additional support with healthy eating and fitness? 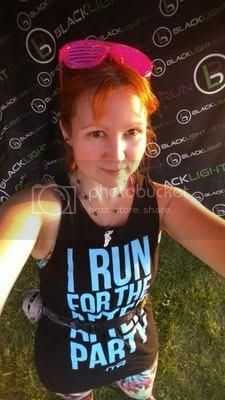 Let me be your fitness coach! Very simple but tasty chocolate vegan Shakeology recipe! Yesterday I was dragged, kicking and screaming, by my fellow alumni, to a fraternity event at the Tea Leaf in Waltham. Well. That’s a bit of a lie. Actually all I heard was the word “tea” and I was already in the car; I think there was a sonic boom. Our fraternity is more of a “fraterni-tea” as teatime has been a tradition of ours since before my time there (they’re really my kind of people), so it made sense that in celebrating the weekend of our fraternity’s 100th birthday that we have tea. So I happily got up early and got as much work as needed to be done before I got there, as the original idea was to be there for about three hours or so, and I had a feeling we would go past closing–which we did. They do afternoon teas there, which involves many delicious sandwiches and pastries, none of which are vegan. However when the owner found out that anything containing eggs and dairy and meat were denied to me, she whipped up some mini vegan sandwiches containing red pepper tapenade and eggplant tapenade plus a beautiful fruit plate. I honestly just figured I would go there and enjoy the ginormous pot of extremely good Earl Grey and get full on that, but I managed to get full on those little sandwiches, the fruit, and approximately eight cups of tea. The entire shop is filled with all kinds of excellent tea, teapots, mugs, and anything pertaining to tea. There is also some lovely jewelry there, and along with two containers of tea some teapot earrings managed to find their way into my shopping cart. Oops. 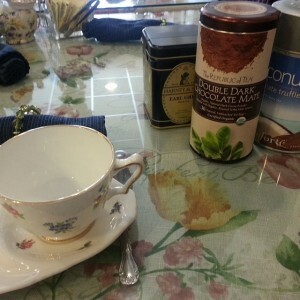 It’s also a very nice, casual place, good to relax in and enjoy your tea. Are you a woman who is interested in bodybuilding, fitness, or weight lifting in general? Vegan, vegetarian, or veg-curious? I’ve started up a closed group on Facebook for us to collaborate, cheer each other on, and share the plant-strong love!